The animation above can be licensed for a single machine for AUS$33. 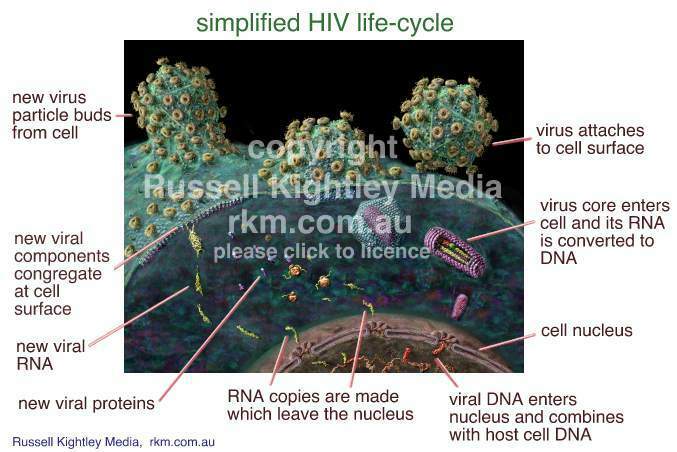 SOME NOTES ON HIV & HIV viral replication: HIV is a retrovirus, which means that it stores its genetic information in RNA. The viral RNA genome is converted to DNA in the cell. It does this using the enzyme reverse transcriptase. When an HIV particle lands on a suitable cell, receptors (shown as golden knob like structures) attach it to the cell surface. The viral envelope joins the plasma membrane of the cell and the viral matrix proteins (bluish) and the viral core (purple) are thrust into the interior of the cell. Inside the viral core the viral RNA is converted to viral DNA which is ferrie to the nucleus of the cell. The viral DNA enters the nucleus through a nuclear pore and integrates (joins) with the DNA of the host cell. The integrated viral genome (or provirus) instructs the cell to produce new viral gemomes (RNA) and new viral proteins. These viral proteins and viral genomic RNA raft together just beneath the cell membrane and assemble spontaeously into new virus particles. The new viral particles push out the cell surface (plasma membrane) and bud from the cell. As they bud from the host cell surface, the virus particles become cloaked in cell membrane and so are known as enveloped viruses. The released virus particles can now land and dock with other cells that have the appropriate receptors on their plasma membranes. Why not try our HIV & AIDS quiz?